E don tey wey plenty people don dey search for happiness, but e be like say two people wey get money don buy am. 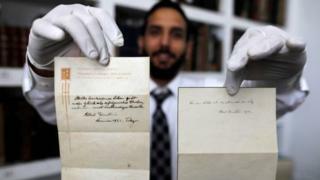 One note wey scientist Albert Einstein write many years ago don sell for one auction house inside Jerusalem for $1.56m (£1.19m). Einstein been give di notes where im describe im theory for happy living to one man wey go message for am, wen e dey one Hotel inside Tokyo for 1922, as e no get money to give am as tip. During dat time, Einstein wey be scientist just hear say im win di Nobel prize for physics, wen im been dey Japan for tour. Wen di Japanese courier come di Imperial Hotel for Tokyo to deliver message to am, Einstein tell di messenger say, if e dey lucky, di notes go become big value wey pass di tip. Einstein suggest for di notes say to achieve di goal wen person don dey dream of to get for long time, no be guarantee to happiness. Wetin Albert Einstein write inside di two notes? "A calm and humble life go bring more happiness than di pursuit of success and di constant restlessness wey dey come with am." "Where will dey, way go dey." Dis second one sell for $240,000, according to wetin di Winner auction house talk. Image example Owner and manager for Winner auction house inside Jerusalem, display di two notes wey Albert Einstein write. According to di people wey sell di note, di winning bids for di two notes dey far higher than di price wey dem first been feel say dey go sell am. Dem say di person wey buy one of di notes na European wey no want people to know say na im buy am. Di person wey be di seller, tori say na nephew of di messenger.